Over a foot of rain fell on the Upper Guadalupe River during September. 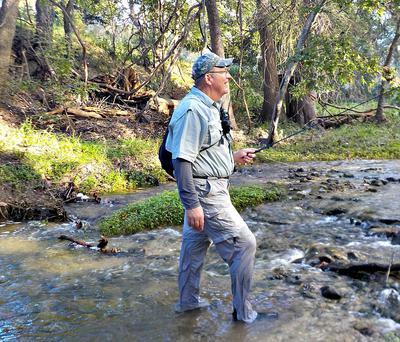 High water can provide opportunities to explore new fishing spots. This nice stretch is normally a dry creek bed. This little bass was taken in a freshly flooded creek. The month of August was extremely dry in San Antonio, TX. Then came the wettest September on record — 19” of rain at my house. Let’s just say the fishing conditions changed. During August, I could count every rock in the rivers and creeks. By the end of September I couldn’t see the rocks! Fishing in high water is a challenge, and it calls for a different mind-set and different tactics. I’d like to mention five points that stand out in my mind. First, stay safe! No fish is worth your life. If in doubt, stay out. Moving water is overwhelmingly powerful. That gentle rivulet a week ago may be a merciless torrent today. Last week you could see the obstacles on the bottom. Today you’re not sure you can touch the bottom. Safety is paramount. If you’re wearing waders, and they fill with water, you can easily drown. Don’t take chances! Second, your old spots probably won’t work well when the water’s up. Currents change, cover becomes submerged, pockets that held fish before are empty now. You can’t get the drift you want. Higher water brings a different set of conditions. If you keep doing what you’ve always done, chances are your catch will go way down. Realize this and re-evaluate your situation. Third, big rivers with big drainages tend to be affected the most and for the longest. I purposely visited all my favorite fishing holes after the heavy rains just to learn how the high water changed them. 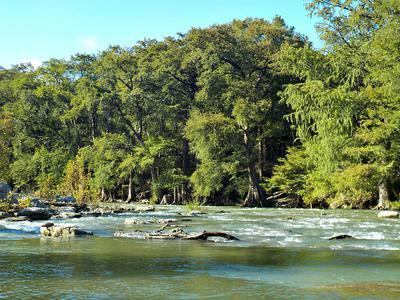 The upper Guadalupe River is one of my favorite spots, but I just couldn’t fish it effectively. The water was the color of milky coffee, and the wading was too difficult and dangerous. On the other hand, one of my neighborhood creeks was just fine. The water came up, but, because the drainage is so small, it also went down quickly. Within a week, this creek was fishable again. Fourth, higher water can open new fishing opportunities. The creek I mentioned above offered even better fishing than before. The reason was simple. 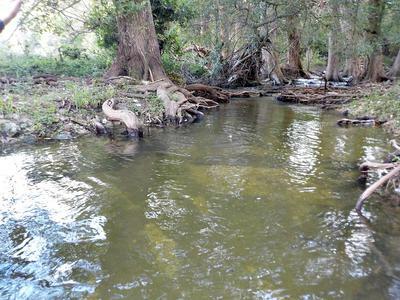 Some of the little tributaries that were normally dry now had a fishable amount of water in them. In fact, I located a number of placid holes that were just right for tenkara. With new vegetation and crowds of drowned insects, the fish were everywhere. 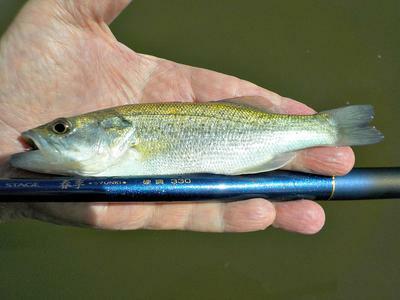 In one spot, no bigger than a living room, I took 30 bass, bluegills, and red breast sunfish on the same fly. What fun! While we had high water, I really wasn’t fishing the high water. Fifth, your fly selection changes. Higher water typically means more staining and more current. To be effective, I had to switch to bigger, heavier nymphs with brighter colors and more flash. Small dry flies in muted colors just weren’t cutting it anymore. A little color and flash, with a little more weight, made all the difference in the world. High water doesn’t necessarily end the fishing, but you do have to stay safe and alter your tactics. In fact, it can provide opportunity to search for new tenkara spots. Great advice, John, caution and safety first! If it looks bad don’t do it. I’ll add one thing, always wear a belt with chest waders. Mine has a folding staff hung from it, and while it’s seldom needed for the warm water streams around home it has on occasion gotten me out of trouble. The staff has been of more use in trout streams and if I’m the least unsure of where I’m wading out it comes. When your waders fill the problem is not what happens when they’re submerged, but when you try to get out of the water. Under water the weight of the water is displaced and the waders don’t weigh more than they do dry. But when you try to get out of the water or even stand up above the surface with full waders you won’t be able to do it. A gallon of water weighs 8 pounds, and you’ll have to peel the waders down to drain them and once on the shore lay down on your back to drain the lower legs. Many years ago I stepped off a ledge and floated my hat. I bounced up, took a breath and grabbed the hat. Back on the bottom I took a step or two, sprung back up for another breath, took another step and "walked" across the small stream’s bottom until I got to where the water was just below the wader’s top. That’s when I found out about the weight of water and peeling the waders down. You said it just right. Anyone who has tried to step on a higher rock, or on dry land, with waders full of water, knows just what you're talking about. Even if you can manage the extra weight, your balance is thrown all off. A belt around the middle is a big help, and the best advice is to avoid the trouble to start with! John - Another great article. In the cold waters of the mountains, I don't fish high water without an inflatable life vest on! I don't care how in shape you are water below 40 degrees will do you in quick! The new inflatable life vests are unobtrusive, and can truly be a life saver. I stepped off a ledge on the Umpqua river and was swept 200 yards down stream. The water was so cold, I barely made it out of the water. Ever since then, I have a vest on. That doesn't give permission to take risks however. Last April I was fishing in 11 degree weather with the appropriate clothing on the Salmon River. Even though it wasn't high water, I felt a lot better with the vest on, knowing if I fell, I had a vest that would keep my head above water with all of those clothes on.